Letterkenny Chapel and the Franklin County Veterans and 9/11 Memorial Park September 10, 2017 at 3 PM. 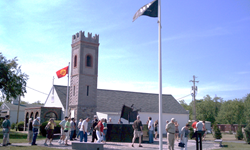 The Franklin County Veterans Park combines the historic Letterkenny Chapel with a 9/11 memorial and military history of Franklin County PA. The guest speaker will be U.S. Army Vietnam Veteran Dwight R. Fuhrman of Spring Grove, who is serving as Pennsylvania Department of Veterans of Foreign Wars (VFW) State Commander for the 2017-2018 VFW program year. Franklin County Visitors Bureau announces annual remembrance event at the Letterkenny Chapel and the Franklin County Veterans and 9/11 Memorial Park on Sunday, September 10, 2017, at 3 PM. The annual event is presented by the United Churches of the Chambersburg Area and Veterans Park Committee. The park is located at Letterkenny Army Depot, 2171 Carbaugh Avenue, Chambersburg, PA.
State Commander Fuhrman served in Vietnam from June 1970 to June 1971. He served with the 199th Light Infantry Brigade, 5th Battalion, 12th Infantry Company A as an Infantryman from June 1970 to September 1970. He then served with the 1st Brigade, 5th Infantry Division (Mechanized), 1/61 Infantry as a squad leader of a 81mm mortar crew on #43 Armored Personnel Carrier from September 1970 to June 1971. Dwight attained the rank of E-5 Sergeant. He was honorably discharged from active duty in October 1971. He received the Expert Rifleman Badge, National Defense Medal, Good Conduct Medal, Combat Infantry Badge, Vietnam Service Medal and Vietnam Campaign Medal. State Commander Fuhrman has proceeded through all of the VFW Post and District Chairs, and continues to serve as Adjutant/Quartermaster at VFW East Berlin Post 8896. The Voice of Democracy Chairman from 2001-2015, he became a State Line Officer in June 2015 when elected as Department Junior Vice Commander. He was installed as State Commander of the largest Department of the VFW in June 2017. A 1968 graduate of Spring Grove Area High School, he has been married to his wife Marsha for 47 years. They have 2 children and 4 grandchildren. He retired from Glatfelter Company after 33 ½ years of service as a maintenance welder. Special music will be presented by the Community Chorus under the direction of Marcel Coates.The Chambersburg Area Senior High School Naval Junior R.O.T.C. Cadets will serve as Color Guard. The Chapel Service will conclude with a rifle salute by the VFW Post 1599 Honor Guard, and the playing of Taps by the Brass Choir as final tribute to those who lost their lives on September 11, 2001.